Super Deluxe Box Set contains 2CD + 4 180-gram LPs + 3DVDs! 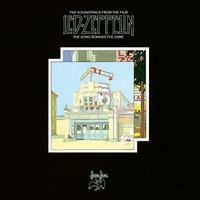 15 tracks including "Black Dog," "Dazed And Confused," "Stairway To Heaven," and more! Led Zeppelin's landmark concert film — originally released in 1976 and capturing highlights from the band's 3-night stand at Madison Square Garden in 1973 — is remastered and expanded with six additional historic song performances on Super Deluxe Box Set 2CD + 4LP + 3DVD reissue featuring liner notes by Cameron Crowe! Led Zeppelin's The Song Remains The Same is the soundtrack to the legendary concert film of the same name, which was released in 1976. The performances in the film were recorded July 27-29, 1973 at Madison Square Garden during the band's tour for its then-current studio album, Houses Of The Holy. Led Zeppelin guitarist Jimmy Page personally oversaw the remastering of this new edition, which is scheduled to arrive on September 7, 2018, via Atlantic/Swan Song. The release is part of the band's celebration of its 50th anniversary. The newly updated edition now contains six songs not featured on the original release. The box set will recreate the embossed cover of the original and will also be the first time the full-length film and soundtrack have been available in the same package. • 2DVD set of the The Song Remains The Same featuring the full theatrical version of the film plus bonus content, including four performance outtakes that were not part of the original film: "Celebration Day," "Over The Hills And Far Away," "Misty Mountain Hop" and "The Ocean"